Term of maximum 4 weeks (total of 40 hours). Dates are not predetermined but are nominated by the applicant between May-July. Location: Concordia University, Montreal, QC. Eligibility: Art History (major or minor) undergraduate or graduate students at Concordia University. What underrepresented area of research in ethnic and cultural art history do you want to investigate and why? 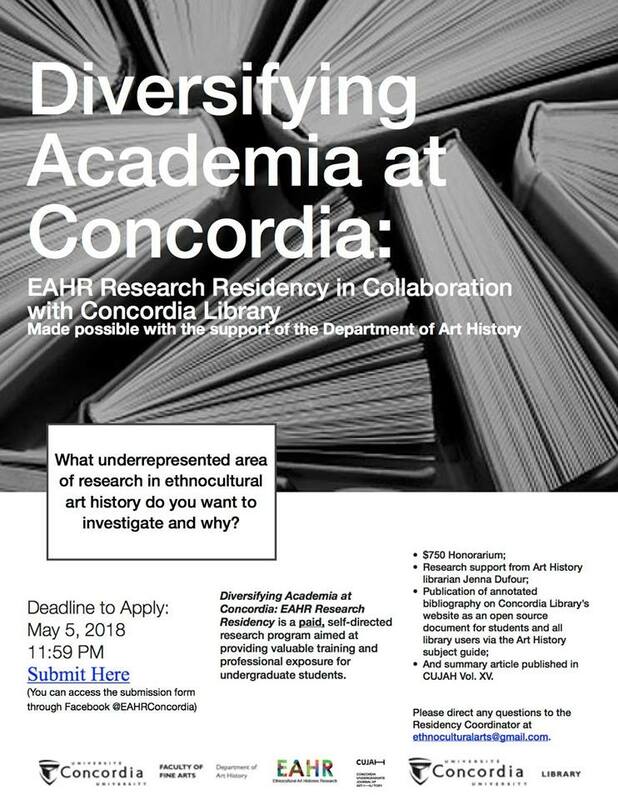 The EAHR Research Residency Diversifying Academia at Concordia: EAHR Research Residency, asks the resident to respond to the underrepresentation of areas of ethnic minority art history research in the sources available in the Concordia University Libraries. 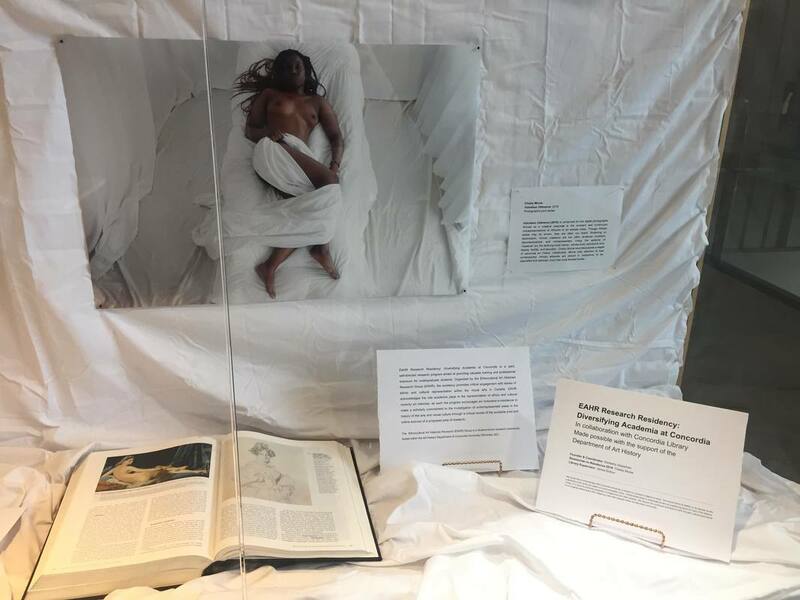 This residency is a self-directed research program that provides residents the opportunity to work independently in the library with the guidance of John Latour (Teaching & Research Librarian - Fine Arts). As part of EAHR’s mandate, the residency promotes critical engagement with issues of ethnic and cultural representation within the visual arts in Canada. 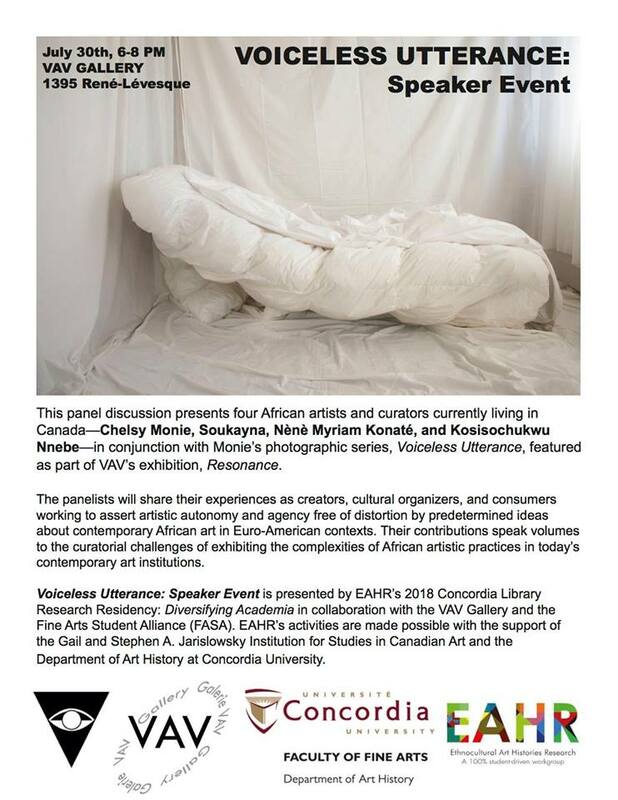 We acknowledge the role academia plays in the representation of ethnic and cultural minority art histories; therefore we, encourage our art historians-in-residence to make a scholarly commitment to the investigation of underrepresented areas in the history of art and visual culture through a critical engagement with the available sources at the Concordia Libraries. 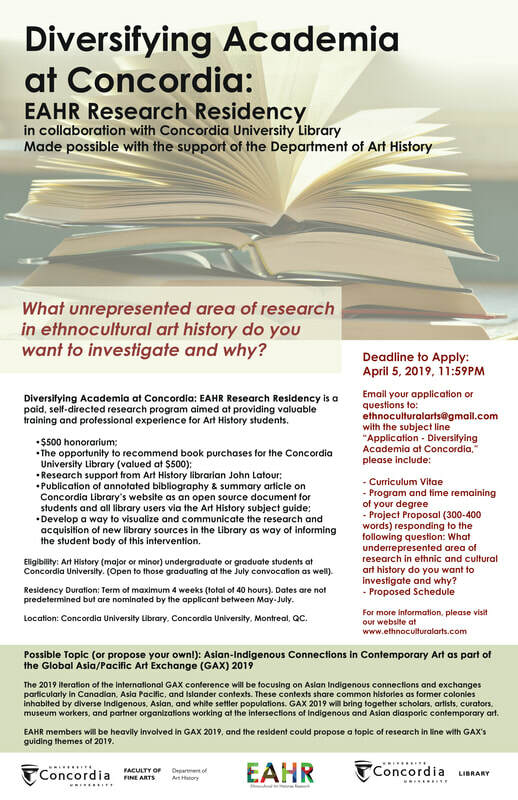 Each resident will be responsible for completing an extensive bibliography on a proposed underrepresented or marginalized area of ethnic and/or cultural art history research and use a $500 book fund to recommend new sources on the proposed topic to be integrated into the Concordia Libraries. Additionally, the research-resident will be responsible for writing an article (length can vary) justifying their research findings and developing a way to visualize and communicate the research and acquisition of new library sources in the Webster library as a way of informing the student body of this intervention. 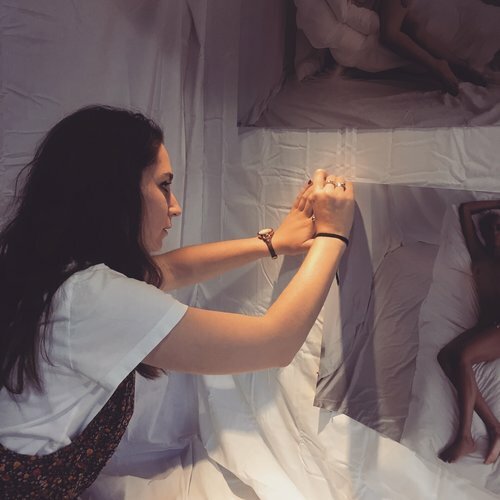 We welcome art history students (major or minor) from diverse backgrounds who have an interest in making visible a marginalized cultural history of art and visual culture in Montreal. Write an article (length can vary) justifying their research findings and develop a way to visualize and communicate the research and acquisition of new library sources in the Webster library as way of informing the student body of this intervention. And to restructure power relations with regards to access to knowledge and ethnic minority representation in academia. Located on the third floor of the EV building, this vitrine exhibition brings together a group of artworks by Bob Haozous, Sky Hopinka, Alootook Ipellie and Michelle Jack that explore themes of indigeneity and mobility across politically and socially imposed borders of settler-colonial North America. A suitcase made of metal wires render visible the concept of borders, their constant dislocation, as well as the ongoing heated contestation over the presence of physical and virtual walls in the twenty-first century. 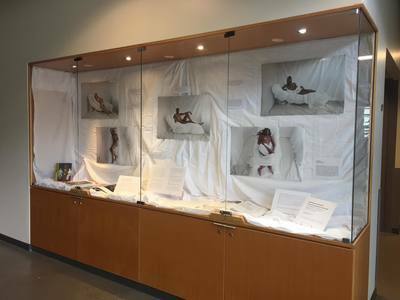 This EAHR exhibition is in partnership with students in Dr. Alice Ming Wai Jim’s course, ARTH 379 Postcolonial Theory in Art History: Migration and Mobility in Contemporary Art, fall 2018. The project is made possible with the support of The Gail and Stephen A. Jarislowsky Institute for Studies in Canadian Art and the Department of Art History. Concordia University is located on unceded Indigenous lands. The Kanien’kehá:ka Nation is recognized as the custodians of the lands and waters of Tiohtiá:ke/Montreal. Facilitated by Priya Zoe Jain, interdisciplinary artist and yogi interested in practices of art & mindfulness practices and their potential as forms of healing. 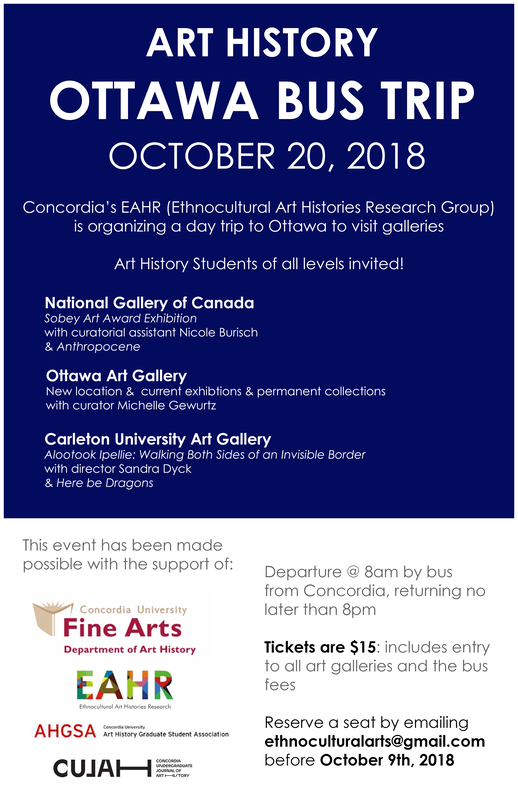 Concordia's EAHR (Ethnocultural Art Histories Research) is organizing a day to trip to Ottawa to visit galleries! Art History Students of all levels invited! Departure is at 8am by bus from Concordia, returning no later than 6pm. In this workshop, we will be looking at anti-racist and anti-oppressive practices as they are shaped by visible and invisible power dynamics, with a focus on how these impact artistic, cultural and academic settings . Working with story-telling, scenarios, and other pedagogical tools, this workshop will be both practical and theoretical, offering participants the groundings with which to engage meaningfully with anti-oppression practices within their own contexts.Participants are expected to walk away with: a clearer understanding of power dynamics and how they play out in visible and invisible ways; a better understanding of their own positionalities within their organizing, artistic and living contexts; tools with which to navigate conflictual situations and develop accountability; basic understandings of how oppression works and what anti-oppression looks like; understanding white supremacist legacies of the canon. To apply, provide the following by filling out this form by 11:59 PM, Saturday, May 5, 2018: https://docs.google.com/forms/d/e/1FAIpQLSfbDXPPubBgEVw3J3a5Rb6pYeG0KaFgJWBKP87eQunYa49GcA/viewform. What underrepresented area of research in ethnocultural art history do you want to investigate and why? Diversifying Academia at Concordia: EAHR Research Residency is a paid, self-directed research program aimed at providing valuable training and professional exposure for undergraduate students. 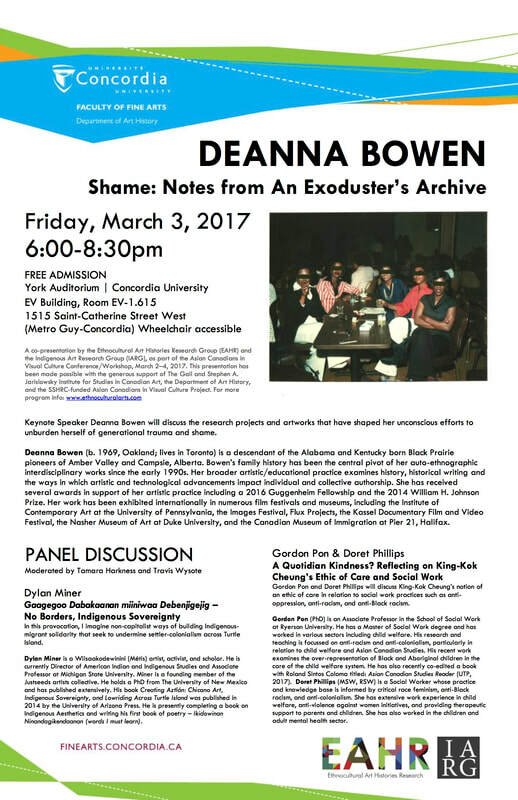 Organized by the Ethnocultural Art Histories Research Group (EAHR), the residency promotes critical engagement with issues of ethnic and cultural representation within the visual arts in Canada. We acknowledge the role academia plays in the representation of ethnic and cultural minority art histories; therefore EAHR encourages their emerging researchers-in-residence to make a scholarly commitment to the investigation of underrepresented areas in the history of the arts and visual culture through a critical review of the available print and online sources of a proposed area of research. We welcome art history students from diverse backgrounds who have an interest in making visible marginalized cultural histories of art and visual culture in Montréal. - And write an article summarizing the research. - And summary article published in CUJAH Vol. XV. 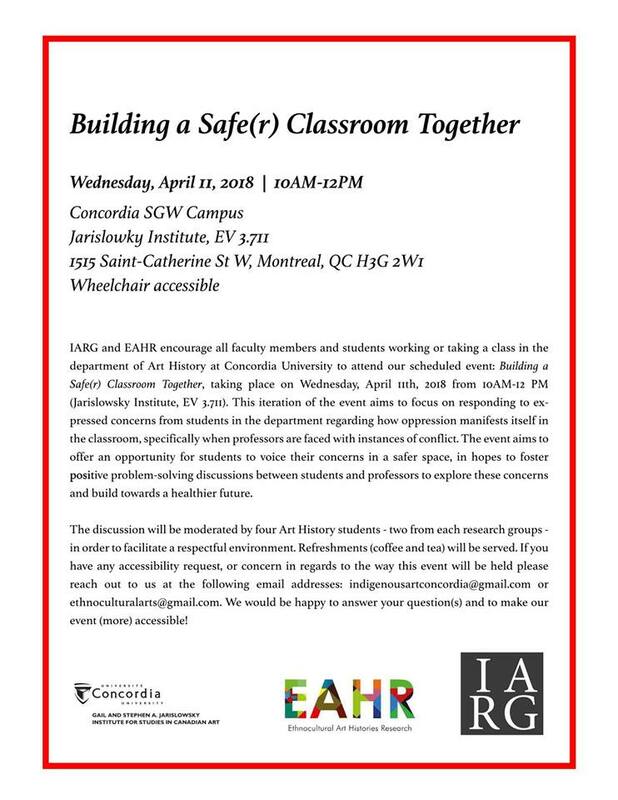 IARG and EAHR encourage all faculty members and students working or taking a class in the Department of Art History at Concordia University to attend our scheduled event Building a Safe(r) Classroom Together, taking place on Wednesday, April 11th, 2018 from 10AM-12 PM (Jarislowsky Institute, EV 3.711). This iteration of the event aims to focus on responding to expressed concerns from students in the department regarding how oppression manifests itself in the classroom, specifically when professors are faced with instances of conflict. The event aims to offer an opportunity for students to voice their concerns in a safer space, in hopes to foster positive problem-solving discussions between students and professors to explore these concerns and build towards a healthier future. The discussion will be moderated by four Art History students - two from each research groups - in order to facilitate a respectful environment. Refreshments (coffee and tea) will be served. If you have any accessibility request or concern in regards to the way this event will be held please reach out to us at the following email addresses: indigenousartconcordia@gmail.com or ethnoculturalarts@gmail.com. We would be happy to answer your question(s) and to make our event (more) accessible! This event is co-organized by IARG and EAHR. IARG is an Indigenous-led group out of Concordia University that works to facilitate fluid spaces of connecting, analyzing, reflecting on, and experiencing the tensions and exhilaration of an ever-changing relationship and balance of power between many nations and cultures. It is our goal to question assumptions and conventions through open discussions that challenge dominant structures. Our focus is threefold: relationships, listening, and Indigenous representation. Realizing that it could become a safer space for exploration for both Indigenous and non-Indigenous experiences, IARG seeks to more directly reflect the needs and concerns of the Indigenous communities and individuals it encounters.